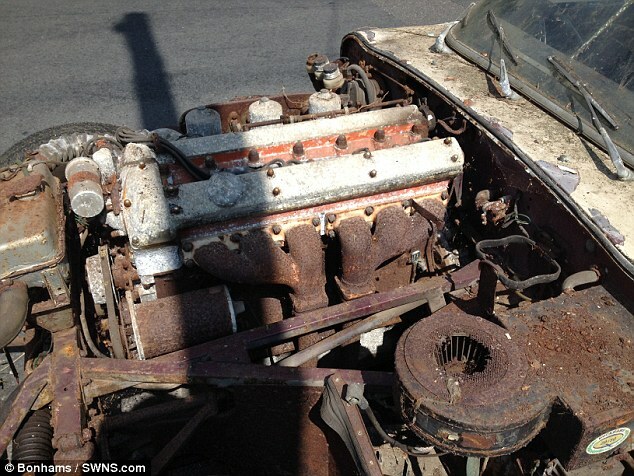 A rusty old Jaguar convertible which does not run has sold at auction for more than £77,000 – nearly five times its estimate – and the new owner will now have to spend another £120,000 to get it on the road. 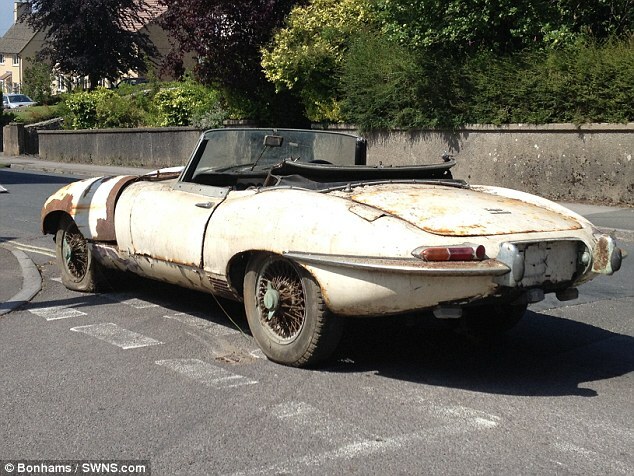 Incredibly, the dilapidated E-Type Roadster sold for £77,760 – the same price as a brand new, top-of-the-range F-Type convertible – its spiritual successor. This is because it is one of the extremely rare ‘Flat Floor’ models, of which there are thought to be just 170 left in existence. 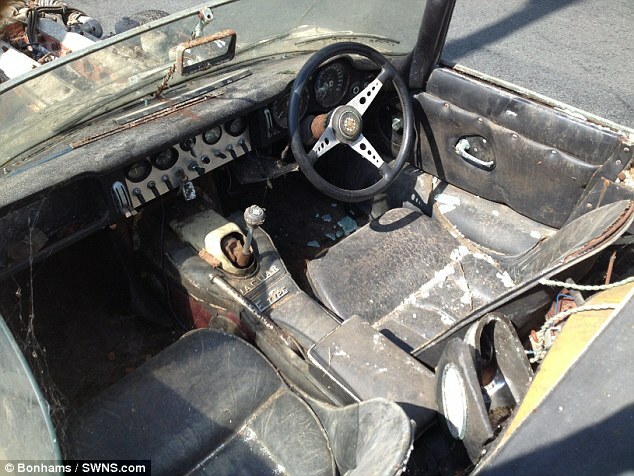 The car has been off the road and hidden away for the last 20 years. When it was finally reintroduced to the world at Bonhams’ Beaulieu auction at the weekend, there was no shortage of interest. 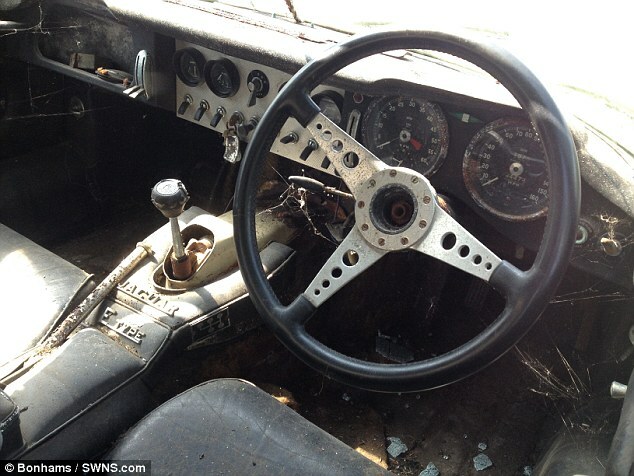 The unnamed buyer was forced to pay way over the £15-20,000 estimate, but even after he restores it there is a chance he could still make a profit on the car. In 2011, a Flat Floor model E-Type in excellent condition was sold for £25,000 less than this one – showing how demand is increasing rapidly. Nick Goldthorp, from Jaguar specialist Classic Motor Cars in Shropshire, said: ‘The early cars are the collectible ones and prices are still going up. 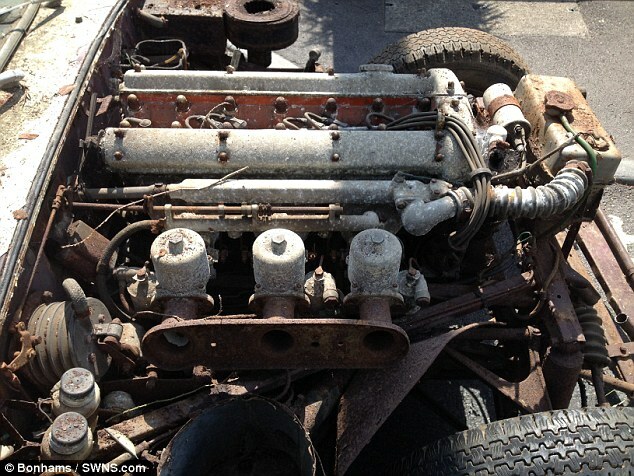 When it is back on the road, the E-Type’s 3.8-litre engine will develop around 265 brake horse power. This will give the convertible sports car a 0-60mph time of seven seconds and a top speed in excess of 150mph. Last month, the E-Type was voted the greatest car of all time, beating Aston Martins, Rolls Royces and the VW Beetle to the crown. The iconic car, launched in 1961, was given the award by new Discovery Channel show Wheeler Dealers , picking up 32 per cent of the vote. The Mini came in second with 20 per cent, just ahead of the Porsche 911, with 18 per cent.